In 2011 the Commonwealth Government awarded Bridges to Higher Education $21.2 million in funding to December 2014 through the Higher Education Participation and Partnerships Program (HEPPP). 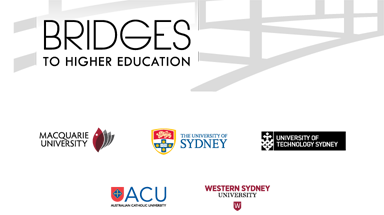 Bridges to Higher Education (Bridges) is a partnership of ﬁve Sydney universities working with schools and communities to improve the participation of students from disadvantaged communities in higher education. Bridges aims to equip students, their families, school staff and community groups with tools and information so school leavers and others can make informed decisions about their future. Bridges aims to engage students through learning opportunities and other activities that support academic outcomes and excite them about the possibilities of higher education. Bridges to Higher Education works closely with over 30 established organisations and service providers and more than 100 primary and high schools. Enquiring Mind series is produced for primary school students and encourages students to develop their interests and hobbies into careers through university study. The television series and website has been developed by the Bridges to Higher Education Participation and Partnerships Program (HEPPP) and Television Sydney, TVS Digital44. Bridges to Higher Education (Bridges) programs aim to engage students through learning activities to support academic outcomes, and inspire students about the possibilities of higher education. Enquiring Minds has been produced with the cooperation of the five parternship Sydney universities with the aim to improve the participation of students from disadvantaged communities in higher education. Thank you to our fantastic hosts, students, academics, participating organisations and their staff, and our University partners for generously giving their time and collaborating on this project.